Are You Tired of Paying $10 - $199 per Stock Footage Video? Then be a smart purchaser. Introducing The Stock Footage Club - A one-time investment for an instant access to 40,000+ High-Quality Royalty Free Stock Video Clips. Available at a special discount for a limited time period. Buy Now!!! Do all of your videos look the same? Are you using the same video backgrounds and footage you bought in 2012 for all of your projects? Reusing and recycling assets because you can't afford new stock video assets? Not anymore. The Stock Footage Club features thousands upon thousands of stock videos in a large selection of categories. In this deal, you will get more than 30,000 stock videos for not just the price of just one video you would pay but a tiny fraction of that. 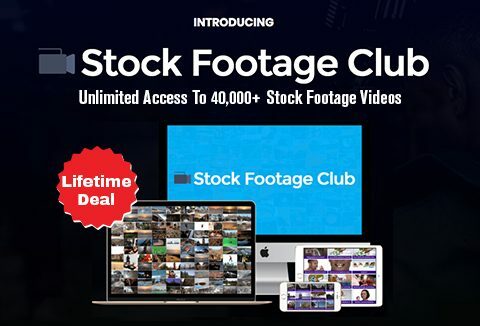 Your Lifetime Stock Footage Club purchase includes lifetime access to our Stock Video site. Unlike other low-cost graphics/ videos/audio specials, this isn't a "fire sale" or "collection". You won't be given a 100 GB dump of unsearchable assets with crazy names like tsv0001.mov - tsv1000.mov. Your purchase won't gather dust on your hard drive. It provides you with 24x7 unlimited access to our online library where you can preview every video and browse or keyword search for videos you want to use. All the videos inside The Stock Footage Club are formatted with high-resolution quality giving you the finest possible details. These stock video clips are in the standard MP4 format so that you can use them in almost all of your video or presentation software out there. All videos are shot in high definition 1080p resolution giving you the best details possible. These videos are distributed into easy to find categories so you can find what you are looking for easily. Wouldn't it be nice to know that after you join the Stock Footage Club through this special promotion, the renewal will be $0.00... Forever? Each and every month you'll SAVE on your stock video fees. Priced under 0.002¢ per video. Just 3 Quick Easy Steps To Unlock The Secret To Never Paying For Stock Footage Videos Ever Again! Browse through our comprehensive, on demand, diverse range of high-definition stock footage videos through our easy to use online member’s portal. Once downloaded, painlessly drag and drop the video into your favorite video editor and be ready to create ground-breaking professionally created videos. Instant Access to the stock videos after the purchase is done. One-time payment only for Lifetime Access to the stock videos. No hidden or extra charges. The videos included are 100% Royalty Free. Increase your video quality, engagements & conversions in all kinds of creative works with these beautiful attention grabbing high-quality video clips. NEVER PAY for stock footage videos AGAIN.!!! At A DealPrice Of $77 Only! What’s the purpose of having the greatest collection of videos, if you can’t find them…? They are first divided in collections (no link to what they contain) and then by topic (ex: animals, beach, etc) for each collection… Not that bad, though I would skip the collection part. A lot of variation, but the quality of the videos need to be improved. The interface of the website needs UX design. An excellent resource for video developers. One time price. Full access to the entire resource. While the indexing is not as good as other resources, it’s still a good investment for a video developer. Muy contento con la compra! Variedad y calidad. I really liked the videos. I was looking around for about one hour and found a lot of interesting videos for my projects. But I have a complain with the search. I guess the problem comes because many videos doesn’t have a name according what they show, instead they have generic names. If you don’t care about that, like me, It really worth it. I hope you all understand what I mean, I just speak a little English.